Bridge Sleeves | Cable Tie Bridge Sleeves | Cal Fasteners, Inc.
Cal Fasteners carries bridge sleeves that allow wire and cables to pass under cable ties without being crushed or pinched, while still allowing the cable tie to be cinched tightly. They are ideal for mounting fiber optic cables, critical sensor wiring, soft insulated wires, and other cables that cannot withstand crushing force. 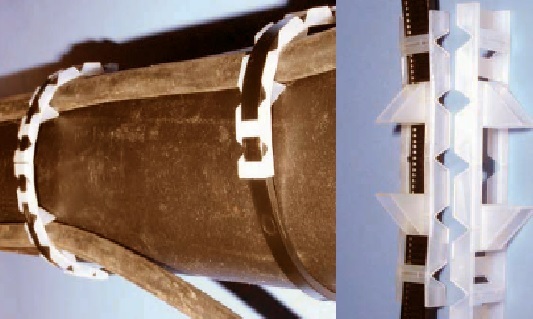 Multiple bridge sleeves can be installed on one cable tie to allow multiple wires to pass under. This helps reduce installation time and costs, and eliminates location restrictions. Bridge sleeves are available in natural nylon, UV-treated black nylon, and heat-stabilized black nylon. All varieties are fully ROHS compliant. Request a quote on bridge sleeves for your application, or contact Cal Fasteners to learn more.